YvesSaintLaurent BLACK OPIUM Eau de Parfum a sensual and thrilling fragrance for women from YvesSaintLaurent, BLACK OPIUM is a darker more mysterious version of Yves Saint Laurent OPIUM with with notes of black coffee accord blended with pure white flowers, the ultimate play of shadow and light. YvesSaintLaurent BLACK OPIUM Eau de Parfum pink pepper, orange blossom, jasmine, vanilla, patchouli and cedar blended with coffee create an oriental, floral and gourmand Eau de Parfum which is indulgent, sensuous and absolutely unforgettable. Head / Top Notes: Black Coffee Accord, Mandarin, Bergamot. Middle / Heart Notes: Orange Blossom, Tuberose, Jasmine Sambac. Base Notes: White Musk, Vanilla Bean, Cashmeran. FREE delivery on orders over £30.00. FREE delivery on orders over £40.00. 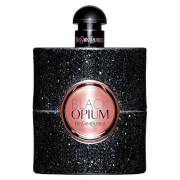 YvesSaintLaurent BLACK OPIUM Eau de Parfum 90ml was found on 5 websites and was price compared using EAN: 3365440787971. The cheapest YvesSaintLaurent BLACK OPIUM Eau de Parfum 90ml is shown as the main item, prices range from £81.60 to £96.00, excluding delivery. Price comparison based on price and delivery charges, with any valid discount codes being applied, is shown in the table above. Prices and information correct at the time of publication.